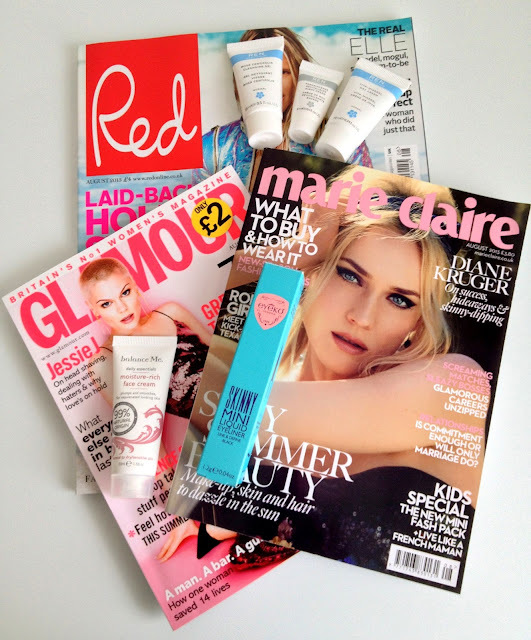 July has been a fabulous month, made even more fabulous by all the magazine freebies I've been getting! Is it just me or have magazine freebies suddenly got way better? I thought it'd be quite fun to review some of these goodies for you, as i'm sure many people will have these same products, and if you're interested to try any of them out you can just pop to your local newsagent and give them a go! With Red magazine, I got this lovely REN set, with Glamour I got a moisturiser from balanceMe, and from Marie Claire I received an Eyeko eyeliner. REN Vita Mineral Day Cream - This moisturiser is gorgeous. It isn't very thick and you don't need very much. It leaves the skin feeling energised and is packed full of different essential oils. It also smells like damascan rose which makes it lovely to apply in the mornings. I've really enjoyed using this. REN Frankincense Revitalising Night Cream - I found this product underwhelming although it would definitely work for someone with oily skin. However, since I have dry skin I didn't particularly enjoy using this product. It does not contain any hyaluronic acid and so therefore it isn't as hydrating as it could be. It does feel revitalizing and smells scrumptious, but I found that it simply wasn't nourishing enough, and I ended up layering this with some argan oil over it. balanceMe Moisture-Rich Face Cream - This is a wonderful product for those with any skin type and definitely a great product for the Winter. It is quite thick in consistency and very hydrating. It actually absorbs into the skin very quickly considering how thick it is, and keeps my skin feeling nourished for the rest of the day. I think I may have to purchase the full size! Eyeko Skinny Mini Liquid Eyeliner - I've never tried anything from this brand before but I must say that I'm very impressed with this eyeliner. It's very easy to apply and you can create a very thin liner look, or build it up into a dramatic cat eye. It's long-lasting, smudge-proof, and has a nice glossy finish. I don't know if it's as glossy as my Chanel liquid eyeliner (review here), but it's great for the price! It also contains hyaluronic acid (which is very unsual for eyeliner) and this is meant to ensure that the colour glides onto the lids with ease. This paraben-free liquid eyeliner is definitely a great product, and I look forward to trying other products from this brand!